Like the sample Power of Attorney below, a Power of Attorney allows you to give legal rights to another person. A “durable” version, like the sample Power of Attorney on this page, extends those rights even if you become mentally incompetent of making decisions. These documents are closely related to other estate planning documents and, keep in mind, that if you want to change the agent named in your Power of Attorney (after a divorce, for example), you can do it at any time. If you’d like to see what a sample Power of Attorney, take a look below. Sample Power of Attorney. 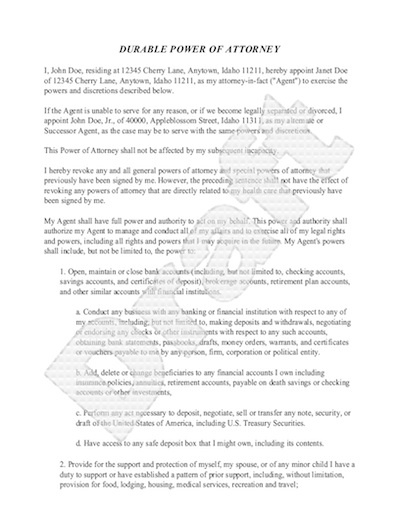 To create your own personalized Power of Attorney, click on the image above. Remember, there are many different Powers of Attorney. The main ones are General (which grants broad powers), Special (such as the ability to access your bank account) or Health Care (which authorizes an agent to make health related decisions for you, should you not be able to). Choosing an agent is a very important step, so choose wisely. Going from a sample Power of Attorney to your own, personalized Power of Attorney is easy. Simply click on the image above or the green button below and get started for free.